Big companies literally pay millions of dollars for software to do these things with ERP, Business Intelligence (BI) and Performance Management Systems (PM). You can do this far more cost effectively by using simple conventions instead of expensive and complex software. These Systems, implemented properly, will raise the performance level of your management team to a world class, professional management team and generate superior results. Generally any company with more than seven people needs Systems #1 to #3. Implement these Six Systems well and your company will likely dominate its market niche because most companies do not do these things well. AirTight Management System #1 - The Strategic Planning Process is the most critical process in your organization. Without doing strategic planning right nothing else can ever correct the issues a bad plan or business model can create. This must be done before a business plan to get optimum results. This system will help you get the most out of your management team and take you and your team through a tightly choreographed three phase process that will create maximum collaboration and results. It will leverage all the wisdom, experience and knowledge in your business. 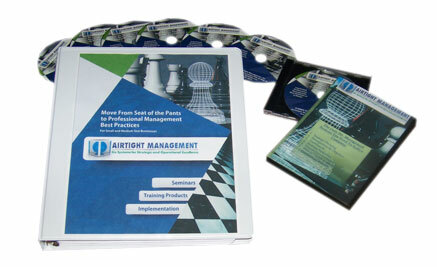 The AirTight Management Strategic Planning System Kit provides not just the skills training and process tools but also over 100 files on CD you will need including: Sample strategic plans, printable worksheets for each step (Word files), various tools and models and even agendas for the key meetings. Use flexible templates provided on the data DISC with all the MS-Word forms, worksheets and agenda items you need plus PowerPoint templates, spreadsheets and sample plans and a license to use this with up to 75 person companies (nominal additional license fee for larger companies see shopping cart). A professional strategic planning facilitator or consultant can cost from $10,000 to $25,000. We generally charge $10,000 plus expenses for a two day on-site facilitation. With this kit you can get many of the same benefits of professional facilitation at a small fraction of the cost. Don't let your competitors get this right when you do not. This seven CD (or MP3) training set contains the three core professional management Systems and many best practices that must be mastered to propel a company to success. It will train your team on best practices in management and leadership in the first three Systems that every company should have before 50 employees, but most don't. #3. The Department and Corporate Dashboards Business Intelligence Systems - Define the best metrics to define and frame success and activities to run a business by the numbers and systematize it. Enable Management By Exception (MBE) which creates leverage to work "on" not just "in" your business, allow for constant improvement (CANI & Kaizen), smooth growth, leverage and drive higher revenue, profits and market share. These three systems implemented properly can take your management team from seat of the pants entrepreneurship to being a high performance, professional management team. Generally any company with more than a dozen people needs Systems #1 through #3 implemented and most any company needs the Strategic Planning Process. This package is guaranteed to improve both your company and your team in ways you cannot imagine until you have used it. You will remove many invisible limiters that are holding your company back today. List of resources including over 15 chapters on key growth issues. Census data and high quality zoomable map of U.S. with market areas. And much more. These files and templates will speed your implementation and give you real samples for your internal use and training purposes. Files are provided in Microsoft Word and Excel 2003 formats for maximum compatibility. Updates are issued every six months so you will receive two with any purchase. Each purchase include one hour of free questions and coaching by phone with an AirTight Management implementation expert. Big companies literally pay millions of dollars for software to do these things with ERP, Business Intelligence (BI) and Performance Management Systems (PM). We do this cost effectively through training and by having a convention instead of expensive software that the entire company must learn on day one to be useful. These three Systems implemented properly will take your management team from "seat of the pants" entrepreneurship to being a high performance, world class, professional management team and company. Generally any company with more than ten people needs all three systems. Virtually every company between 7 and 250 employees should be using these practices and Systems to become more productive and efficient. 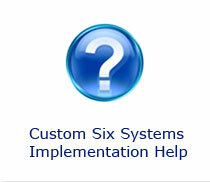 For phone orders, questions, on-site training and customized implementation help call (508) 381-8013. The following individual audio CDs are available to sample our products but due to the holistic nature of these systems these are not recommended for other purposes. Growing a company requires very different skills and practices than starting a company. Less than one in one hundred companies will reach $5,000,000 in sales. More often than not a founder or early CEO will be replaced by a ?professional manager? to achieve this. This is not necessary when proper training and shifting of management style is implemented in time. Once a company reaches between twelve and twenty five employees it must begin to implement professional management best practices. These come from over 75 years of management science developed by the best business minds of the last century. Do not make the mistake of trying to reinvent the wheel ? learn from others first. This training explains not just what these best practices for growth are but when and why they are needed so that all employees in the company can understand and buy into doing these properly. You will learn the physical limits of managers, communications and more and how to get around them. This CD will open up your mind to the hidden traps of growth that must be averted with careful training and learning in advance. AirTight Management is the result of over twenty years of experience collecting all the best practices from over one hundred of the best business minds of the last century. These ideas have been tested in the real world growing many companies. Our founder personally grew two companies to over $100 million in sales from startup using these principles. They have also been used in hundreds of other companies since 2004 when we first began publishing pieces of this material. This audio set is for companies that are generating sales and would like to scale larger and gain market share. It provides an overview of the Six Management Systems you will need to break through growth barriers at $1MM, $5MM and $20MM or more in sales. Less than one in one hundred companies reaches $5,000,000 in sales because they do not understand how they must change their management style and practices to get through the many invisible barriers and traps of growth. This CD will open up your mind to the hidden traps of growth and show you the Systems that you must implement to grow without limits. It is an overview and not a "how to" training set which requires the full training sets above. This AirTight Management training CD reviews the best practices processes for developing a superior corporate strategic plan. Strategic planning is an art but there are many procedural elements that can be used in a structure to facilitate the best results from any management team. A good strategic facilitator can cost $10,000 to $25,000 for a two day strategic planning session. These can be worth every dime but many smaller companies cannot afford this level professional experience and wisdom from a experienced CEO. This training lays out the three step, collaborative process you can use with your own team over a period of weeks to develop and optimize a long-term plan for your company. This System is specially designed to be practical for companies with between ten and several hundred employees. We also offer a complete Implementation Kit with four additional CDs and a data CD with forms, templates and example plans. There is one and only one factor that drives the financial success of most growth businesses. Everything else comes as a result of doing this well. This is ?differentiation? or more accurately positioning for competitive advantage and differentiation. Commodity companies do not grow rapidly and can not command high margins and profits to finance growth and new products. Only companies that offer something unique, properly targeted to a niche of customers with a compelling need will achieve superior success and growth. 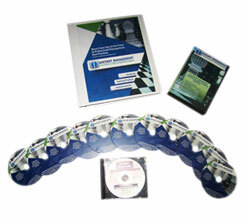 This audio training set lays out the best competitive positioning processes available today. These techniques are taught in the top Ivy League business school?s MBA programs for hundreds of thousands of dollars. This System has been optimized for practical and easy use at small to medium size companies. It is guaranteed to improve your business and generate ideas you have never had before. The saying ?Innovate or die? is more true with each passing year. Companies must evolve their products, services and processes to maintain competitiveness and gain market share. Sometimes they must completely morph their business models. This audio training is part of our complete strategic planning kit but available separately as a standalone CD and MP3 download. We will review over a dozen structured ways to drive innovation, and an innovation culture inside your organization. Of course any time there is innovation there is also risk. Market acceptance risk, technology risk, financial risk, distribution risk and other types can all be easily handled. We will teach you a simple system to access risk and keep your management team on top of each risk easily using a Risk Landscape Map which can be used to look at new products, your entire business or even more granular decisions that should be reviewed collaboratively. Risk analysis and management are a fundamental part of any strategic planning which can make the difference between success and failure. When you know the downside is covered well you can take more risk and reap more rewards. Preparing your business to scale requires that you develop good internal metrics for each area of the business. Very few companies do this well and it is actually fairly simple and makes a huge difference. Dashboards allow you to leverage your all your managers? time better, identify problems quickly, set performance goals, hold people accountable and many more wonderful things that will help your business grow faster and with less cost and risk. This audio training reviews the proper way to design and implement a Corporate Dashboard and one for each department. Typically a business needs these in any department over five people and should use them on day one in any sales, production or operations area. Dashboards must measure four types of numbers that typical accounting and budgeting measurements do not capture. Dashboards create a time series of data that is very strategic and helps project and improve your business. Dashboards are one of the AirTight Management Six Systems that will allow you to move your company from good to great. Budgeting is generally run by the accounting department and looked at as a cost control and tracking function. That?s what bean counters are supposed to do. Right? Wrong! Strategic Budgeting is a much more powerful and collaborative system that will generate superior results in any company. Strategic Budgeting is opportunity and revenue driven, instead of cost driven. It focuses attention on sales drivers and leverages that experience, market position and opportunities created by a good strategic plan. Strategic Budgeting is done in each department from the manager up as a collaborative process which is tied in to annual strategic planning and objectives. Strategic Budgeting will be far more accurate and creates more innovation, ownership of the results and sales success. Strategic Budgeting also grows managers into leaders as successful companies must develop their own teams. Turn your budgeting process into an exciting and innovation generating process that will further corporate goals.